Imagine that you are comfortably sitting in your clinic and could answer the queries of your clients sitting in the other end of the country via your smartphone. Your patients personally cannot visit you but send you medical questions, diagnostic reports and their current status and you could counsel them instantly with the same accuracy as you do face to face. 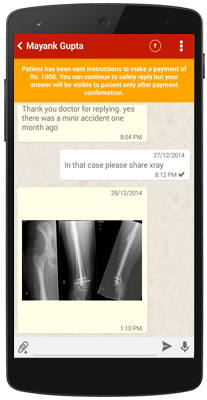 No we are not talking about WhatsApp here, we are talking about a more formal, doctor specific and customized app that is replicating the real question answer treatment scenario into a virtual format. All you have to do is download a practice management app by Lybrate on your Android or iPhone and get going. It has been designed especially to cater the medical information need of smartphone users, as the world is gradually shifting from PCs to mobile phones for everything they need, doctors are no exception. This practice management app allows them to give virtual consultation through mobile with the help of a featured question answer feature that is the primary service of the platform. On the question-answer feature, a patient can ask doctors two types of questions – questions that will be open to all the registered doctors and questions that a patient can ask privately to a specific doctor. On the open question platform, a patient could put up a question that will be open for any doctor to answer. This has several benefits for both the patients and the doctors. For doctors, as several other doctors could answer a query, it helps in increasing the knowledge sharing between the community while at the same time it helps to enhance the reputation and connection between the community, along with growing their clientele. For patients, the biggest benefit is in the credibility of the information they are receiving, as it will give them opinion from several doctors at the same time. This way it solves the apprehension of second opinion as well. It, in fact, provides multiple opinions. As far as private questions are concerned, it gives the freedom to a patient, sitting in any corner of India, to choose a doctor of his choice and likewise, a doctor too will have the convenience to consult clients who they cannot reach physically and build a repo with patients. These unique features of Lybrate make the service flexible and doctor friendly. The open question services are free of cost while there is a subscription charge for private question services. For doctors, all the services are absolutely free. Though, the virtual consultation of patients is a growing phenomenon among medical community in India with the profound penetration of smartphone and internet, the recent researches suggest that doctors are increasingly getting annoyed by the use of social platforms for medical queries as they hardly get any benefit out of it. Assistance to patients on social platforms is casual, free and unorganized. It is here that the many benefits of Lybrate come into picture. By using Lybrate, doctors have an access to an organised platform to fix appointments, a liberty to decide till which level they can provide free consultation, which of the services are paid and a freedom to decide the counselling hours. The virtual consultation thus remains no more a nightmare but a potential platform to grow income, get more patients with making clientele management an easy deal. Or simply put — WhatsApp for jokes, Lybrate for health. 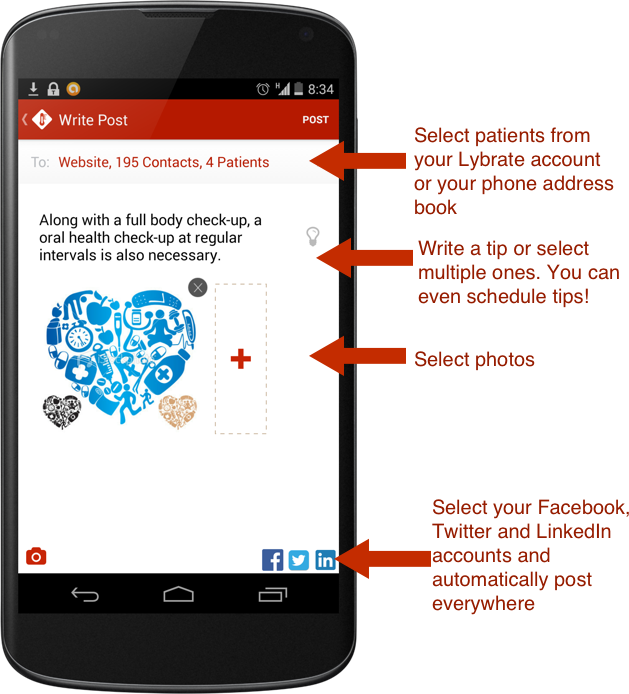 Lybrate uses an interface that helps in uploading photos and conducting chat with patients from anywhere, anytime using a desktop, laptop or smartphone. The important information like treatment history, medical reports, current state of the patient can be easily accessed by medical practitioners through the user-friendly interface. Among other interesting features, Health Feed is one that feeds patients with daily dose of health tips. The best thing about this feature is that it provides crisp, one-line health tips by doctors. Interested doctors can post the health feeds to help patients get credible health information. Though healthcare delivery in India still remains out of bounds for many, the IT enabled healthcare services are slowly disrupting the conventional ways of healthcare delivery. Founded by Saurabh Arora and Rahul Narang in 2013, Lybrate is enabling healthcare to be more accessible to patients while expanding the horizons of practice for doctors. Doctors in India are increasingly getting aligned towards mobile-based application to save precious time and enhance their services. Mindful of this fact, Lybrate aims to reach every nook and corner of the country, especially using mobile as a medium. The platform already has more than 35,000 doctors registered, including Ayurvedic and Homeopaths, and the number is only growing every day.